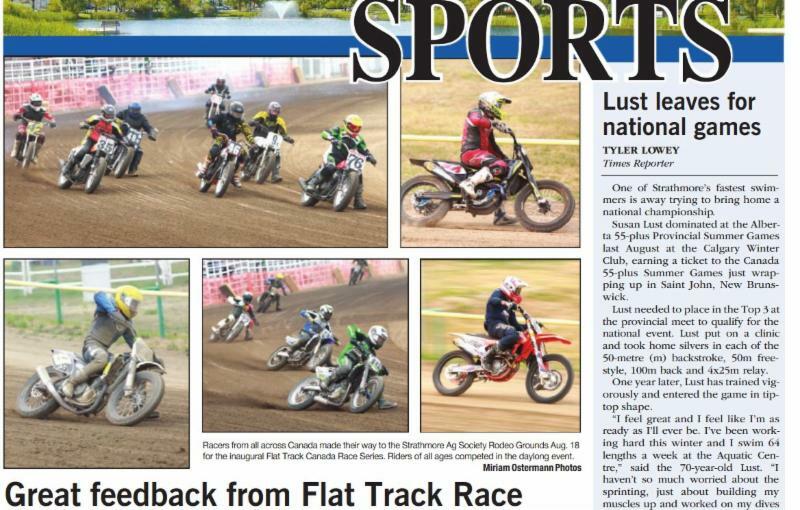 A glance at Flat Track Canada’s national series on the west coast. 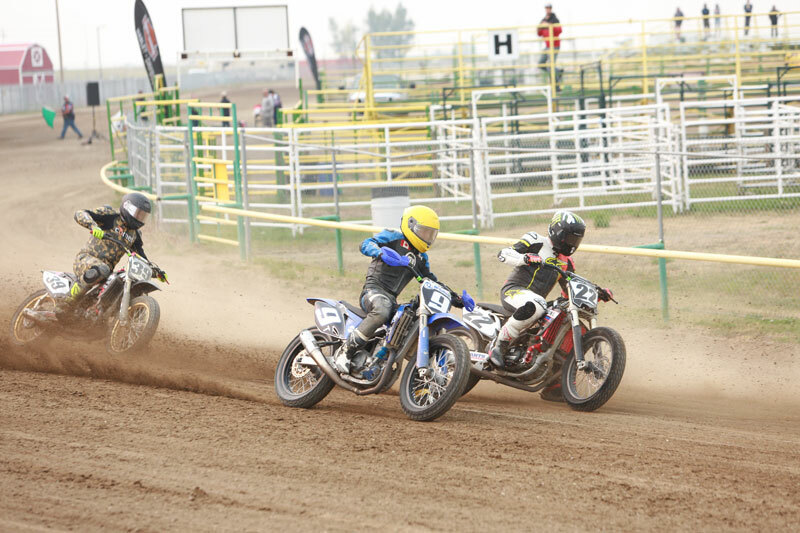 Rounds eight and nine were held in Alberta this year which is a first for a flat track national since 1985. In a land so vast Canadian motorsports tend to typically struggle trying to laterally travel and support each other in a “true national” scenario spreading from coast to coast. 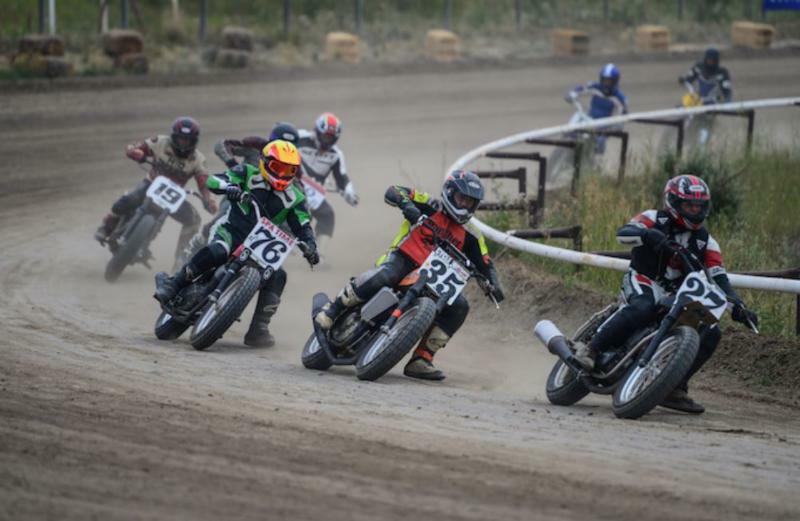 After six years of Flat Track Canada, president Aaron Hesmer decided it was time to take a gamble and add rounds from the west coast to the Harley- Davidson Flat Track Canadian Championship. “Without starting somewhere, we will never be able to evolve all of Canadian Flat Track to where we all fantasize it to be. It will take time, money, dedication and perseverance but the west has a big opportunity to grow and become just as popular as it is in the east.” The events went over well and had proven to be successful in both Strathmore Alberta and Drumheller Alberta which hosted competitors from all major provinces in Canada including; British Columbia, Alberta, Saskatchewan, Manitoba, Ontario and Quebec. 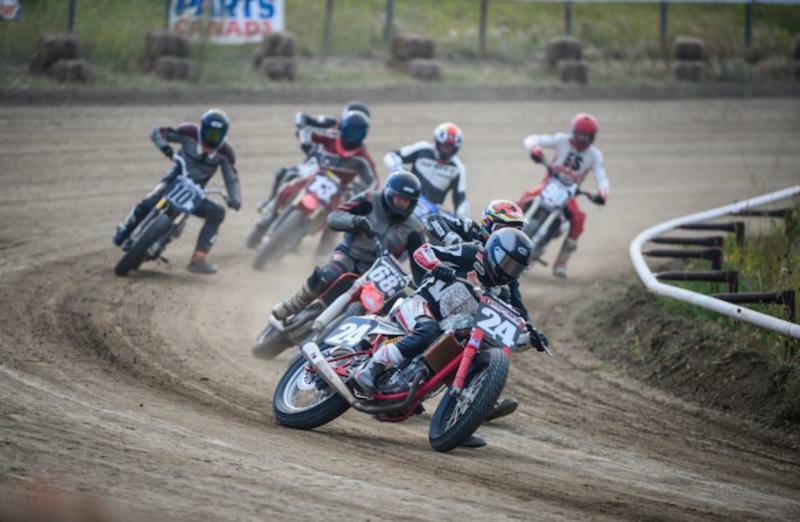 Round eight of the Harley Davidson Canadian National flat track series took place in Alberta as the Flat Track Canada crew headed west for a couple of weekends. 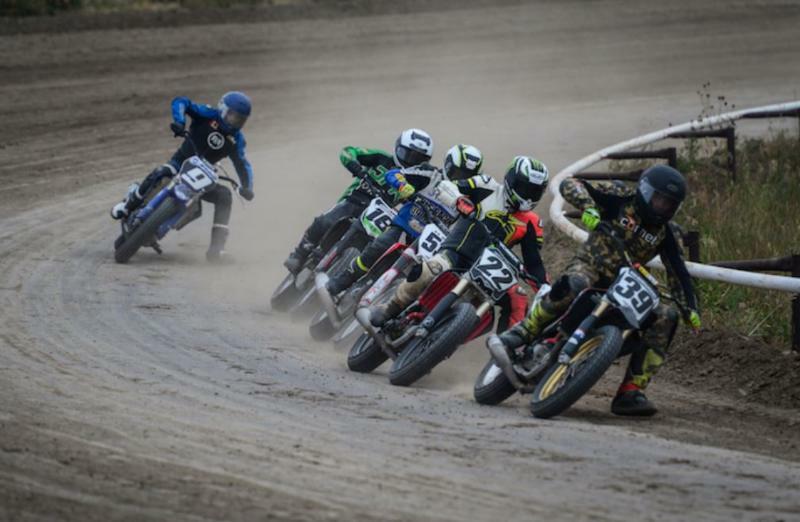 The big 5/8 mile track in Strathmore was the first stop on the western swing while the following weekend the action took place at Dinosaur Downs in Drumheller. 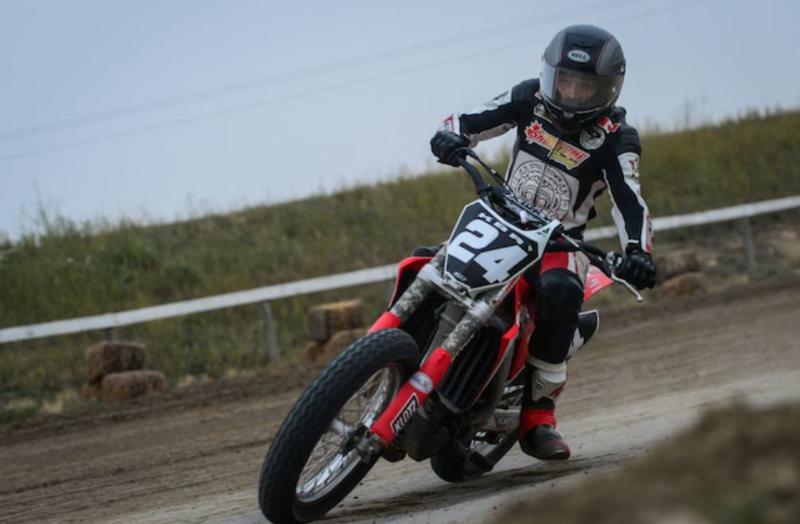 As for Round 8 in Strathmore, the points leader going into the weekend which is second year expert racer Dustin Brown (16 years old from Bracebridge, ON) had a very strong weekend although his trip was not without some drama. 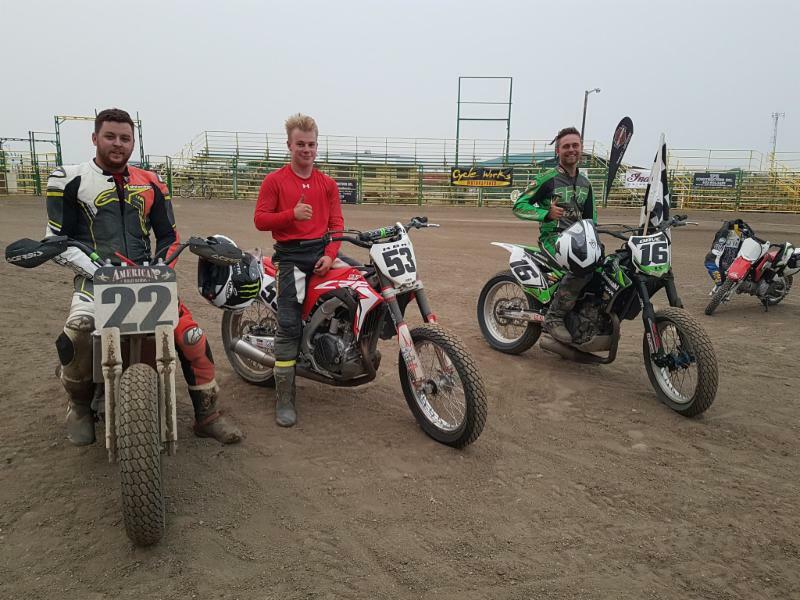 After having his Sehl Racing Yamaha go south early on in Strathmore, Brown jumped onto a Honda courtesy of Kurt Biegger for the remainder of the trip. Brown looked fast instantly on the Honda, and the end result was taking the victory in the DTX class, and winning the Dash for Cash. Points contender Dave Pouliot (Quebec, QC) took home the big win in the premier open expert category, after switching the front end on his JPR Racing Kawasaki just before the final at the big track in Strathmore. Tyler Seguin (Welland, ON) had some good runs on his Evans Racing Honda and was able to take a second in the DTX and a third in Open Expert. Jimmy McCullough (Paris, ON) made the jump to Expert at the Strathmore round and after battling Seguin unsuccessfully for third. The Intermediate class was owned by KBR Racing rider Hunter Bauer (Chippawa, ON). Bauer not only swept both races he was in, but he was turning faster times and speeds than the Experts at Strathmore. Jarrett Phibbs(Leamington, ON) had a great ride as well picking up a couple of second place finishes, while Kyle Sheppard also visited the podium. Round 9 took place at Dinosaur Downs Speedway. It happens to be Canada’s largest and fastest clay oval dirt track in current use. The city in Alberta is named as the destination capital of Alberta for motorcyclists named by Alberta Tourism and it definitely shows with spectacular views of the badlands even at the speedway itself. The picturesque backdrop of the valley overlooking the badlands turns your eye away from the not so eye friendly facility of Dinosaur Downs Speedway however the track crew lead by DDS president Mike Hansen did an incredible job to satisfy the conditions to be great for national level racing. It was a pleasure to be among some of the legends of Canadian flat track racing. 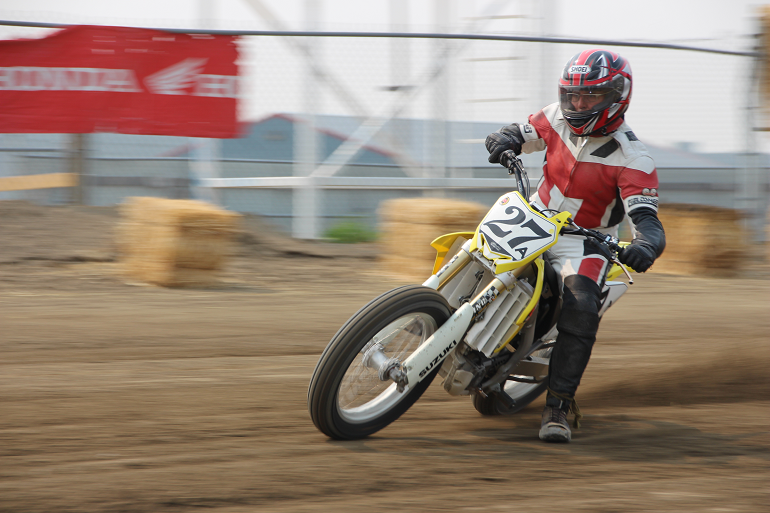 Many of the Western Flat Track legends are now in their 60’s, however still very fast and competitive. Royal Adderson (Calgary, AB), Darryl McCrae (Calgary, AB), Don Galloway (Edmonton, AB) and Paul Germain (Winnipeg, MB) are just a few of the names that stood out. In the expert group, Tyler Seguin and Dustin Brown fought and battled hard most of the day, meanwhile rookie expert Jimmy McCullough had a very strong showing of the clay half mile. DTX expert main went back and fourth between Brown and Seguin. The ‘Dash for Cash’ seen Jimmy McCullough lead 3 of the 4 laps until making a small rookie mistake slipping off the groove only to let Dustin Brown who once again rode for KBR Racing Honda to take the big cash prize home. The open final, seen Dustin Brown to an early lead but the big race was for second place between Seguin and McCullough. With only a few laps remaining, Seguin solidified his second place spot earning him more championship points. Second place point standing Dave Pouliot seemed to struggle all day on his JPR Canadian Kawaski motorcycle to two fifth place finishes giving up a bigger points gap between Dustin Brown and himself. The hot racing of the day goes to the intermediates who were definitely worth price of admission alone. Thirteen year old Hunter Bauer once again dominated and proved he is ready for the expert ranks, winning both DTX and Open Intermediate on his KBR Honda CRF450, but the real racing was behind him. Lap after lap and corner after corner passing all the way. In the open final Bohdi Edie of Saskatoon battled hard with Kyle Sheppard (Burlington, On) on his fast & fresh Husqvarna FC450, Sam Villanueva (Vancouver, BC) and Jarrett Phibbs (Leamington, On). In the end Villanueva came into turn three pinching down Sheppard, making Sheppard check up and on the brakes too hard, instinctively trying to keep the motorcycle upright pushed Bohdi Edie wide allowing Phibbs and Dan White to go by both of them. Novice class was a battleground between Devin Edie (Saskatoon, AB) and Nick Caldwell (Abbotsford,BC). In the end Nick Caldwell fought well and hard for his victory in the both Novice classes on his Husqvarna. 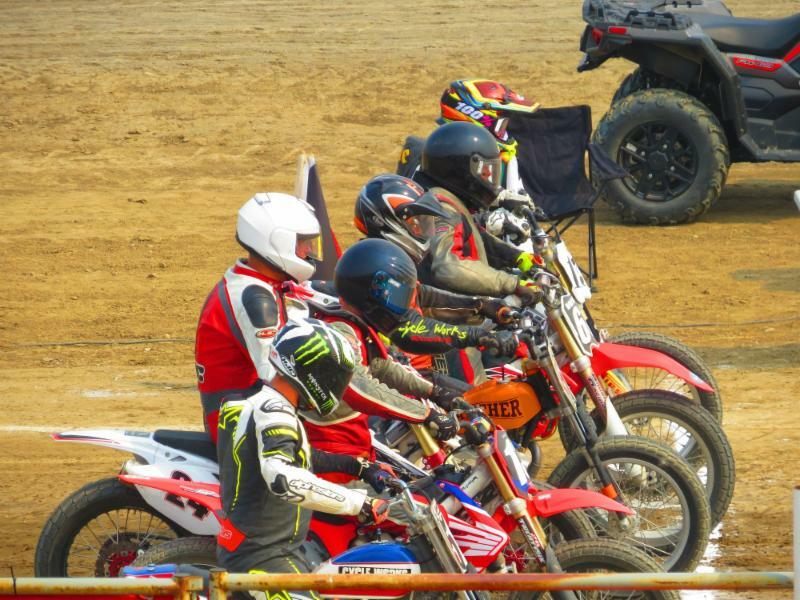 The Vet class was the biggest class of the day with some of the best racing. Don Galloway came out with the win on his panther framed 600 Honda over Darrell MacRae in second, and Devin Edie rounding out the podium. In the end there were over sixty race entries and hundreds of fans. The atmosphere was amazing and the fans were definitely into the action. Overall the west coast swing was a good success and a great building block to create high end racing to the west coast. Very inspirational for many and it achieved the dreams of truly bringing people together from all over Canada.